For Christians, the criterion of truth is fidelity to Christ and the faith that was “once for all delivered to the saints” (Jude 3). The Saints, being wholly united to Christ by the Spirit in his holy Church, in turn become the empirical datum par excellence by which truth is measured. This is why, for Orthodox Christians, the teachings of the Holy Fathers are received as an authority to be followed and believed, far and above whatever opinions any individual or group may have. I offer this foundational belief as a preface to discussing the issue of relations between the Orthodox Church and the See of Rome, which in light of the forthcoming Apostolic Pilgrimage is a topic generating some discussion in ecclesiastical circles. Since Vatican II, Rome has developed the ecclesiological notion that our schism is a matter of separated ‘sister churches,’ and that the Orthodox Church ‘lacks little to attain the fullness that would permit a common celebration of the Lord’s Eucharist.’. Does the Orthodox Church share this understanding of the schism and the status of the Roman Catholic church? To answer that question, we must turn to her Saints and synodal decrees. And when we do, the answer is a rather unambiguous ‘no’. When we examine the controversies with Rome in the lives of St. Photios the Great and St. Mark of Ephesus (in the ninth and fifteenth centuries respectively), we find clear repudiations of Rome for her heresies—so long as she holds to them—and in the latter case, a rejection of the possibility for union with her for that very reason. 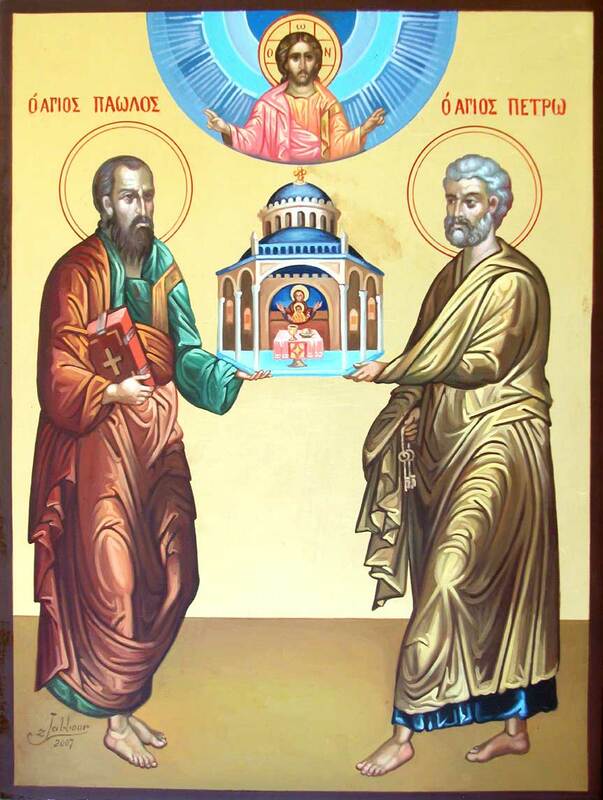 In the eyes of the Orthodox Church—who not only canonized these men, but deemed them ‘Pillars of Orthodoxy’—their teaching with respect to Rome was vindicated over against papism, filioquism, and ecumenism. St. Photios’ teaching against the Filioque and papal supremacy was formally affirmed by the Church at the ecumenical Council of Constantinople (A.D. 879–880), and St. Mark was vindicated and affirmed in the Church’s rejection of the false union of Basel-Ferrara-Florence. At this juncture, one might posit that much has changed since the fifteenth century, and heterodox bodies may have drawn more into conformity with Orthodox doctrine over the centuries, and therefore, such bodies ought to be closer to full Eucharistic communion. For this to be the case, there would have to be some dramatic movement—not in gesture or disposition, but in dogma and life—of Roman Catholicism towards Orthodoxy, at least since the time of St. Mark of Ephesus. But the notion that Rome has moved in this direction is untenable. If anything, she has moved further away in a number of important respects. The Roman Catholic Church [today] is not even that same church with which the Orthodox Church led by St. Mark of Ephesus refused to enter into a union. That church is even further away from Orthodoxy now, having introduced even more new doctrines and having accepted more and more the principles of reformation, ecumenism, and modernism. Even many traditionalist Roman Catholics would agree with this honest assessment. And since the fifteenth century, there have been no shortage of Orthodox Saints who have addressed the issue of Rome, her teachings, and her standing with respect to Orthodoxy. Strikingly, there is not an ecumenical sentiment to be found anywhere among them. The baptism of the Latins is one which falsely is called baptism . . . because they are heretics . . . Enough was said concerning them by St. Mark of Ephesus in Florence (at the twenty-fifth general assembly), who spoke frankly as follows: “We have split ourselves off from the Latins for no other reason than the fact that they are not only schismatics but also heretics.” Wherefore we must not even think of uniting with them. The truth of God, the whole, pure, and saving truth, is to be found neither in the Roman Catholics, nor in the Protestants, nor in the Anglicans. It is to be found only in the One True Church, the Orthodox Church . . . The Roman Catholics [were] the first to split from the Church. The first radical protest in the name of humanism against the God-Man Christ, and his God-Man organism—the Church—should be looked for in papism, not in Lutheranism. Papism is actually the first and the oldest Protestantism. But the ‘union of churches’ is difficult, if not impossible. Those who speak of ‘union of churches’ do not know the mindset of the heterodox nor the height of Orthodoxy. . . I do not want, at least now, the ‘union of churches’ because the Romans will not change, and the Orthodox will not be corrupted. [I]f each denomination contains only a part of the Christian faith, only the Orthodox Church contains the totality and plenitude of the true faith, ‘which was transmitted to the saints once and for all’ (Jude 3) . . . 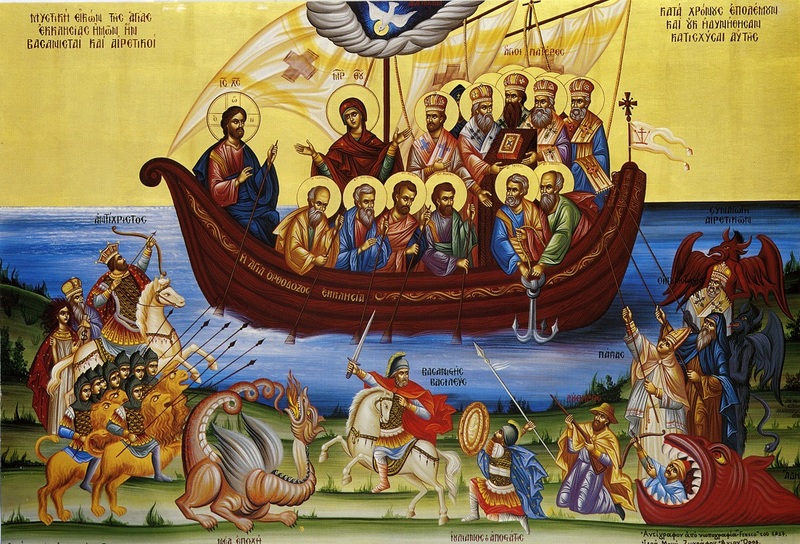 The union of all the churches cannot be achieved through mutual concessions, but only by adherence by all to the one true faith in its entirety, as it was bequeathed by the Apostles and formulated at the Ecumenical Councils; in other words, by the return of all Christians in the one and indivisible Church to which belonged the ancestors of all Christians in the entire world during the first ten centuries after Christ. It is the Holy Orthodox Church. This consensus among fairly recent Saints in opposition to a union with Rome—so long as she remains committed to her errors, of course—would not be so striking if there were also Saints in favor of either ecumenism or religious pluralism. But in fact, they simply don’t exist. One counterpoint might be Rome’s theological dialogue with the Orthodox Church on the Filioque in recent decades. But for me, it's difficult to see in this much beyond equivocation, along with an example of Rome’s “doctrinal development,” which in itself is fundamentally problematic for the Orthodox Church, abiding by the apostolic dictum: “maintain the traditions even as I have delivered them to you” (1 Cor. 11:2). With all that being said—and without apology—none of this calls for vehemence or ill-treatment of Roman Catholics. On the contrary, it’s an essential call of the Gospel to engage in dialogue, while speaking the truth in love. This includes sincerely listening to concerns, being cordial, and, as St. Paul says: “becom[ing] all things to all men, that I might by all means save some” (1 Cor. 9:19–23). This emphatically (and obviously) does not include compromising the Gospel message itself, of which the orthodox doctrine of both the Trinity and the Church are central. There is nothing loving about letting your brother persist in destructive error, if he earnestly desires the truth. It is even less loving to try and wed truth with falsity, thereby blaspheming against the Most Holy Trinity. There’s no need for us to tell Christians who aren't Orthodox that they’re going to hell or that they’re antichrists; but we also mustn't tell them that they’ll be saved, because that’s giving them false reassurances, and we’ll be judged for it. We have to give them a good kind of uneasiness—we have to tell them that they’re in error. On the one hand there’s The Mystery of the Church and of the Eucharist in the Light of the Mystery of the Holy Trinity, Joint International Commission for Theological Dialogue (Munich, July 1982); from the Pontifical Council for Promoting Christian Unity under Pope John Paul II. In which it is essentially conceded that the Orthodox are right and always were. On the other hand, there’s the continued confession of the Filioque.